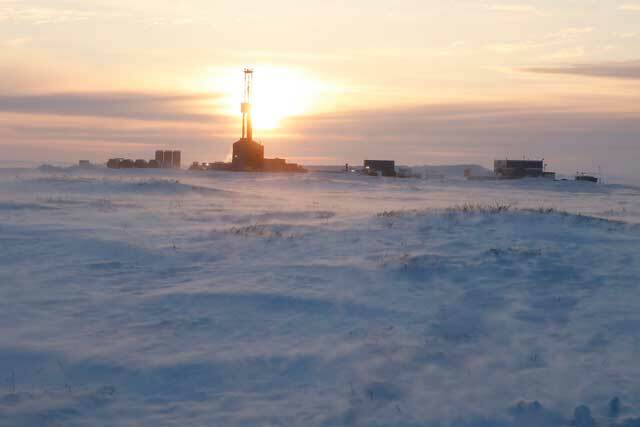 ConocoPhillips believes its recent winter exploration campaigns on the North Slope have added up to 1.4 billion barrels of oil and gas resources to its portfolio, company officials said in a July 16 presentation to investors. The estimate is largely derived from the results of the six exploration and appraisal wells the company drilled into its western Slope prospects last winter, which built on the work of two wells drilled in the federal National Petroleum Reserve-Alaska in early 2016. The 2016 drilling led to ConocoPhillips’ Willow oil discovery — a shallow, Nanushuk formation-focused prospect — with an early oil estimate of up to 300 million recoverable barrels announced in January 2017. Company leaders said July 16 that four more wells drilled into Willow early this year indicate the field could hold between 500 million and 1.1 billion barrels of gross resources that will cost between $4 billion to $6 billion to fully develop, with first oil potentially in the 2024-25 timeframe. It was also noted that roughly 75 percent of the company’s prospective acreage in the area is yet to be drilled. With a conventional target zone in the 4,000-foot range, ConocoPhillips also believes it can produce from Willow for less than $40 per barrel, according to a release accompanying the presentation. ConocoPhillips Alaska leaders have previously said Willow could produce at rates up to 120,000 barrels per day with standalone processing facilities, an investment the company is now leaning towards. The Putu and Stony Hill wells the company drilled this year on state leases south of the Nanushuk discovery in the Pikka Unit collectively hold another 100 million to 350 million barrels, according to ConocoPhillips. Production from those prospects has been pegged at up to 20,000 barrels per day each. ConocoPhillips is also expected to bring its roughly $1 billion Greater Mooses Tooth-1 project online sometime late this year. Located just east of Willow in the NPR-A, GMT-1 is expected to produce up to 30,000 barrels per day at its peak. The company is also in permitting with the Bureau of Land Management to develop its Greater Mooses Tooth-2 prospect, which is generally a mirror and just to the south of GMT-1.